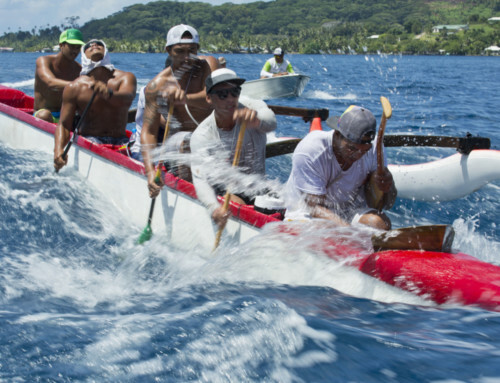 Aside “va’a ” and surfing, various Ma’ohi disciplines have travelled through the different periods and are still enjoyed by many people, especially during the Heiva festivities in July. They are numerous and are often linked to activities of Polynesian people’s daily life – past and presents. The most well known are: javelin throwing, stone lifting, fruit carrier race, the copra contest, coconut tree climbing, etc. These disciplines require excellent physical conditions but also a certain controlled strategy. When the period of the “Tuaro Ma’ohi ” (Polynesian games) arrives, the excitement reaches its climax. The inhabitants of Tahiti and Her Islands gather to compete in a friendly way and to support their champions. Real flashback – it is the moment for Polynesians to reconnect with ancient customs, and for everyone to discover or re-discover these traditional activities which have endured time and have found their place in a modernised Polynesian world. 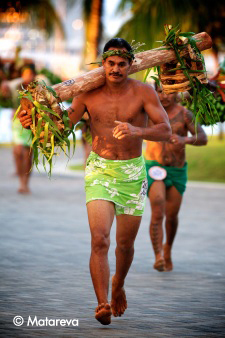 Javelin throwing – main discipline of the Tuamotus Islands consists in using a javelin made out of “purau” (beach Hibiscus) to reach a coconut tree of 9.50 meters high. Stone lifting is a speciality of the Australes Islands and in particular of Rurutu. It brings together men and women. The competitors must lift a stone weighing between 80 and 140 kilograms, hold it on their shoulder for 3 seconds, and drop it on the ground. This activity was formerly done to determine the strongest man of the islands. Mono’i was thus coated on the stones to make the task even more difficult. The fruit carrier’s race is sport of mental, physical force and of endurance. The loads carried are made up of oranges, bananas stems, coconuts and other fruits. They can weigh up to 50 kilograms, and the competitors carry them by using a piece of wood on their shoulders. 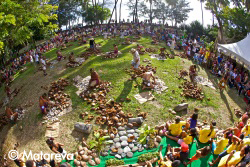 The copra contest consists in breaking open coconuts in a minimum of time and extracting the pulp. The storage of the pulp as well as cleaning the work area are important. This contest can be done in teams or individually. This activity is still very widespread in Tahiti and Her Islands by copra producers. Climbing coconut trees is a discipline which requires a great dexterity and agility. One by one with their bare hands the participants climb up a rather high coconut tree as quickly as possible. These “Tuaro Maohi” activities are very popular and are the pride of all Polynesians.